Writing high-quality text isn’t just a matter of combining well-researched facts and insightful commentary. In fact, many people make the mistake of overlooking a very simple aspect of good writing: your text must be easy to read. Put simply, if readers find your text difficult to understand or follow, all your hard work could be wasted. For this reason, it’s important that you consider your text’s ‘readability’. This is a somewhat vague measure that describes how easy or hard a given text is to read and comprehend. While defining exactly what makes something more or less readable can be tricky, doing so is vitally important if you want to create high-quality content. In this article, we’ll explain the basics of what makes content readable and why that is important. We’ll also show you how to improve readability in WordPress using the Yoast SEO plugin. Let’s take a look! Whenever you write something, you need to make sure that people can read it without difficulty. If that sounds like a painfully obvious statement, you might be surprised. In fact, many writers ignore this tenet, which can lead to content that’s hard to make sense of. The phrase commonly used to describe this aspect of a text is ‘readability’. A text with high readability is easier to read, while low readability signals that many readers will have trouble with it. Naturally, there are plenty of factors that determine how readable a text is, including design elements. For example, font size, color, and layout can all affect readability. However, in this post, we’re going to focus exclusively on readability from a content perspective. A commonly-used measure is the Flesch–Kincaid readability test, which scores how easy a sample of text is to understand in reference to school grades. For example, a text with a high score might be written at a 5th grade reading level, while one with a low score would be best understood by college graduates. Some common factors that affect a text’s readability include how long your sentences and paragraphs are, how the text is formatted, and the types of words you use. We’ll be looking closer at these factors later on. First, let’s explore why readability is so important to begin with. The most obvious and crucial reason readability matters is that it makes your texts easier to consume. After all, you’re writing with the intention that an audience will not just read the result, but understand and absorb the information it contains. If you’re writing online, you’ll likely also have a specific message or end goal you want to impress on your readers, such as a Call To Action (CTA). As such, it’s vital that those readers don’t give up on reading your content part-way through. What’s more, your content’s readability can also be a factor when it comes to Search Engine Optimization (SEO). 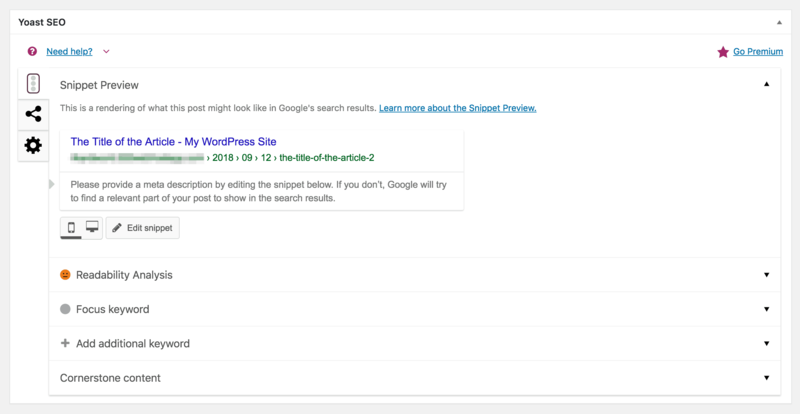 In fact, Google considers ease of reading a factor when ranking sites. While it’s not certain how much this can affect your rankings, it’s clear that search engines take readability into account when analyzing the quality of your site’s content. In addition to these direct benefits, improving your content’s readability can also help you make your site more accessible. If your texts are easier to understand and scan through, it will help people who aren’t fluent in your site’s language or have cognitive disabilities. Not only will this ensure that your site is more inviting, but it also helps you grow your potential audience. Writing in a way that’s easy to digest and understand isn’t rocket science. In fact, it’s often just a case of making minor changes to optimize the content, rather than requiring a complete revision. Most techniques that improve readability are also rooted in simple, common-sense practices. Let’s take a look at seven of the most important strategies you’ll want to use. It’s almost tiring to try and get through this entire sentence, with no breaks between thoughts. By splitting this up into sensible chunks, we get a much more digestible section of text. However, this isn’t to say that you should only ever use short sentences. In fact, it’s best to mix shorter and longer sentences together, to create a sense of dynamic rhythm that’s pleasing to read. 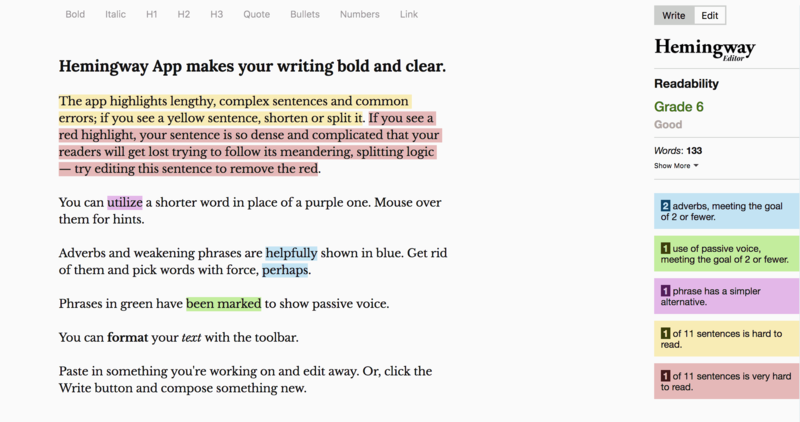 As with sentences, keeping your paragraphs concise is a quick way to improve readability. A paragraph rarely needs to be longer than five sentences or so, and should ideally revolve around a single subject. As you can see, this looks very cluttered. It can even be difficult to focus on a single sentence, as each gets lost in the wall of text. Just as you should break up your paragraphs, it’s good to separate sections of your text by using frequent headers. Not only will this make your article easier to scan, but it’s very important for ensuring accessibility. You can see this in practice on most blogs, and even within this post. By separating related paragraphs into clearly-defined sections, it’s made obvious to the reader what they contain and how the content as a whole is structured. Sometimes you can’t avoid using complex or obscure words, especially if you’re writing for a particular niche. However, it’s best to use simple alternatives as often as possible. For example, instead of dropping in a word like “expeditious”, you’ll get the same result by simply using “fast”. While it’s tempting to include ‘five dollar words’ in your content to make it sound more impressive, this ultimately just makes your text more unclear. Remember that your goal is to communicate effectively, not to impress readers with your vocabulary. Transition words are terms and phrases that show how one phrase or sentence is connected to the next. Some examples include “however”, “because”, “therefore”, and “on the other hand”. They act almost like a glue between sentences, helping to create a logical structure and narrative. Leaving out transition words makes your text harder to read, because it’s less immediately clear how everything relates. Instead, try and add plenty of transition words throughout your content. No matter what you’re writing about, it’s generally a good idea to be as brief as you can. Avoid stuffing your text with unnecessary filler, and try to cut out sections that don’t add anything to your overall point. These only distract the reader, and make it less likely that they’ll read all the way through to the end. Concision applies at all levels of your writing. We’ve already discussed the importance of keeping your sentences and paragraphs short, for example. Yet it’s also important to look at your content as a whole, and make sure you aren’t padding it out unnecessarily. The writer used active voice. Passive voice was used by the writer. As you can see, passive voice places the focus on the verb (“used”) rather than the subject (“the writer”). As such, the second sentence feels weaker and less engaging. It’s also less clear, as the subject of the sentence isn’t stated until the end. That’s why keeping passive sentences to a minimum is a key component of readability. 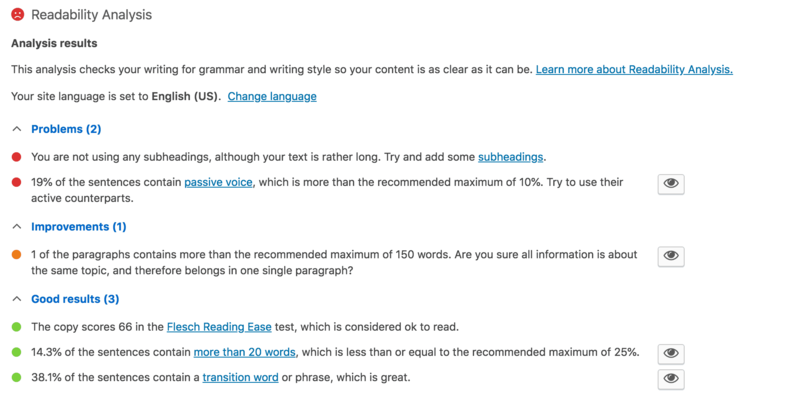 You might already be using Yoast for its SEO capabilities, but it also includes a helpful Readability feature. This will analyze your posts in real time, suggesting ways you can make them easier to read. Now, you don’t always have to aim at getting all green lights, and you shouldn’t use this as your only measure of the text’s quality. However, by referring to these suggestions, you’ll be able to rework your texts to be more readable and engaging. It doesn’t matter how much time and effort you put into your text if your audience is struggling to read it in the first place. This is why the concept of readability is so important, and why you should take the basics to heart. Not only will this improve your writing, but it can also be a benefit to your site’s SEO. In this post, we’ve discussed the ins and outs of readability. While this can seem like a tricky subject to get your head around, it really boils down to common sense. Write concisely, consider how clearly your points are coming across, and get rid of the filler. Doing this is made even easier with a tool like Yoast SEO. Do you have any questions about how to improve readability in WordPress? Let us know in the comments section below!